Find our cheapest flights from Auckland to Whangarei. Northland welcomes you with blissful beaches, amazing historical stories and its own special brand of subtropical charm. 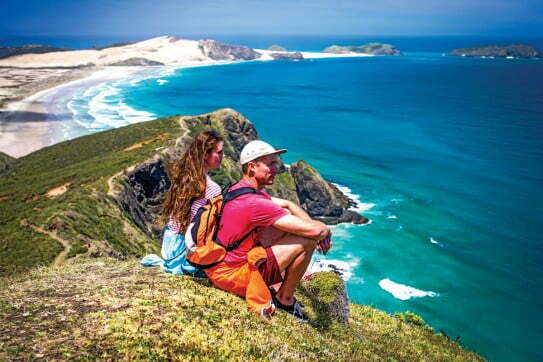 Whangarei is your starting point for a subtropical Northland adventure that takes in gorgeous beaches and bays, kauri forests, island sanctuaries, giant sand dunes and significant historic sites. Before you hit the road, make sure you check out the Quayside Town Basin complex - it͛'s the happening place for harbourside dining and shopping. Other Whangarei things to do include visiting the Quarry Gardens, checking out Whangarei Falls and following the beautiful coastal road that leads to McLeod Bay. Out near Whangarei heads is the Mount Manaia Track, a wickedly good walk that culminates with blockbuster views of the harbour and coast. Sweeping ocean views provide a backdrop for the Waitangi Treaty House and the ornately carved Maori meeting house - Te Whare Runanga. Immediately east of Whangarei is the Tutukaka Coast, an area that͛'s all about beaches, surfing, fishing and relaxing. You can rent a bach (beach house) or find a campsite at places like Ngunguru, Matapouri and Sandy Bay, then settle in to a glorious holiday lifestyle that͛'s dictated by the tide and the sun. Offshore from this region is the Poor Knights Islands marine reserve, a world-renowned diving location. Dive boats leave daily from the township of Tutukaka. Further north you͛'ll find the beautiful Bay of Islands, a haven for nature lovers and adventure seekers. You͛'ll discover intrepid boat trips, perfect beaches, untouched native forests, fabulous day walks and interesting historic sites. Nearly a century ago this area was named ͚the angler͛s Eldorado͛ by Zane Grey, and in terms of New Zealand͛'s history it͛s the birthplace of our nation. At the Treaty House in Waitangi, Maori and European joined in signing New Zealand͛'s founding document in 1840. Sweeping ocean views provide a backdrop for the beautiful gardens surrounding the historic house and the ornately carved Maori meeting house - Te Whare Runanga. Within the grounds of the estate, you can also see Ngatokimatawhaoru - a large ceremonial waka (canoe). Then it͛'s time to head west to the Hokianga region for New Zealand͛'s most significant kauri experience, the magical Waipoua Forest. Tane Mahuta stands tall as the largest kauri in existence - almost five metres in diameter. Not far from here is Opononi, where you can go catch a boat across the harbour to giant dunes for a sand-boarding session. After an aerobic climb up, the only way is down. If the tide͛s in, you͛'ll zoom right out into the water. Awesome doesn't even begin to describe this experience. You can also find sand boarding up at Ninety Mile Beach, a strip of coastal paradise that extends to Cape Reinga, where a classically beautiful lighthouse overlooks the meeting point of the Pacific Ocean and Tasman Sea. Whangarei is in Northland, New Zealand's only subtropical climate zone. This region has warm humid summers and mild winters, so it's comfortable in any season. Even if winter, Northland's temperatures seldom get down to single figures. Summer is the busiest time for tourism. If you want to enjoy uncrowded beaches, choose spring or autumn. Cape Reinga lookout image courtesy of Northland Inc.